Dayna Miller decided to stop at Sam’s Club in Edison to pick up a few items during a break from her job as a weight loss counselor. 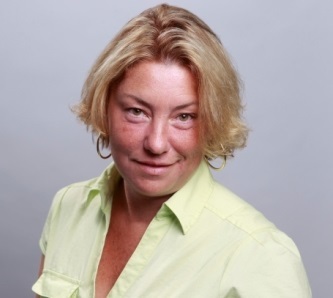 Miller parked her 2007 Chrysler Sebring in the Sam’s lot, but before getting out of her car, she called a friend to see if she needed anything. So Miller shopped, and when she was done, the manager handed her a copy of the accident report, she said. Miller said the manager told her she’d hear from the store’s insurance company in three business days, and in the meantime, the manager said he’d talk to the lot attendant and review the videotape of the lot. Miller said three business days passed, and she didn’t hear anything. So she waited a little longer. Friends suggested she also post it on the Sam’s Club Facebook page, so she did. It said, “Cart allegedly involved in damage to customer/member vehicle,” and the “Incident description” said, “Cart hits car.” It also said it was a windy day. We reached out to Sam’s Club with Miller’s story and we asked it to take another look. It said it would, including a consultation of the video of the incident. 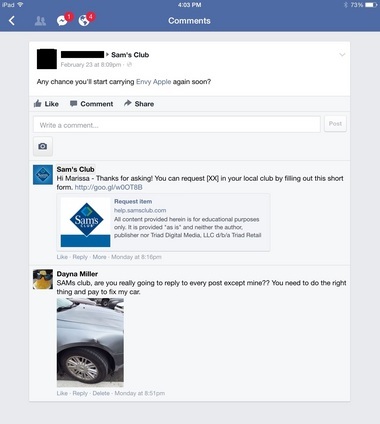 We reached out to Sam’s Club again to see why it changed its mind. We asked if the company had any comment on the lack of detail in the manager’s accident report, and if we could see a copy of the video. Our further requests were not answered. 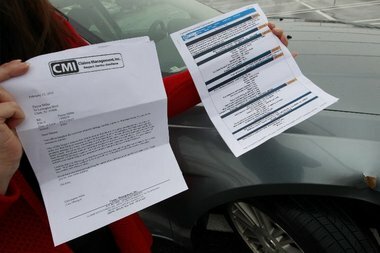 Dayna Miller holds the accident report and claim denial letter she received from Sam’s Club after she said her car was damaged by runaway shopping carts.